I have been hitting the lunch break practice sessions hard the last couple weeks. This has been the somewhat uncomfortable result. I feel like I should consider some kind of protection or is this just my inner wuss speaking? I would be interested to see if others also have "casting arm"
Throwing distance. 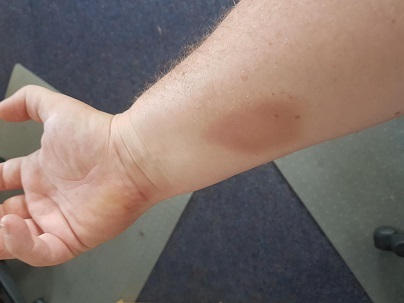 That’s quite a bruise Matthew. I also get bruised, but only occasionally like that. I have considered leather pads but that’s as far as I’ve got with the idea. I think there would be some interesting options here. I’d love to hear what you come up with!